Do YOU know what week it is? SHARK WEEK! We just love Shark Week in our house! My boys just love sharks and we get a kick out of having a whole week devoted to them. I always like to make a fun treat. 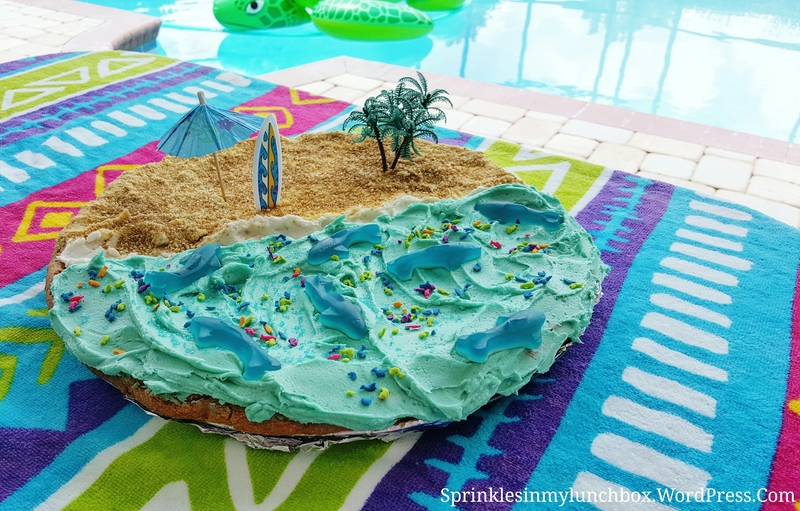 This year, I made a cookie cake! It is an enormous chocolate chip cookie, “choc” full of chips. 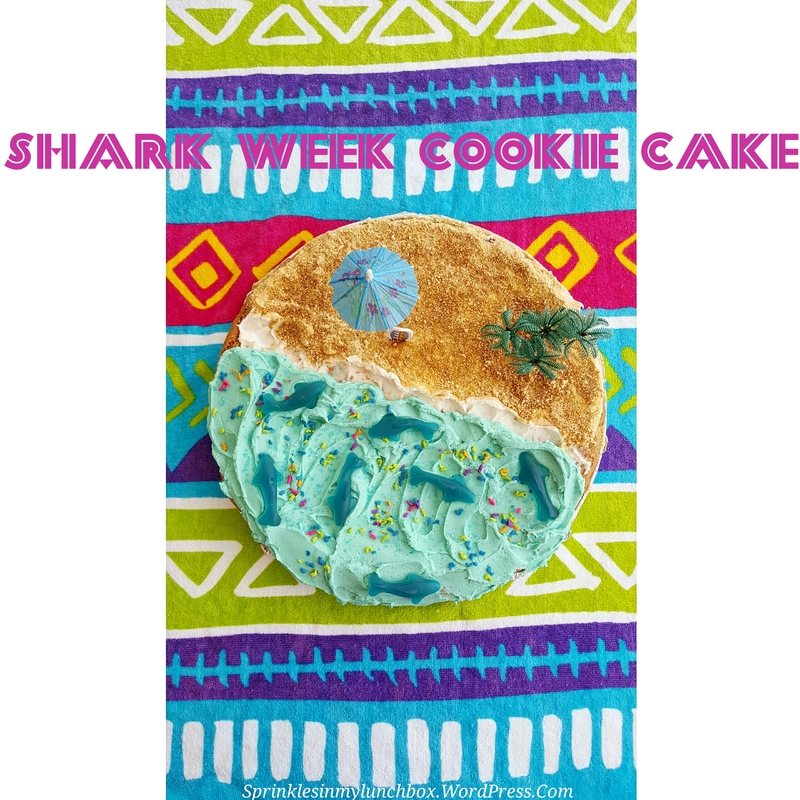 It is covered in creamy, vanilla frosting ocean water, its frothy waves lapping up to shore, meeting the gold, glittery beach. Let’s hope that the owner of the surfboard went for a walk! Yikes! Those waters are super shark infested! Mix the first 5 ingredients. Then add the flour. Fold in the chocolate chips. Press into a greased cookie/pizza pan. Bake 18 – 25m at 350F. Mix together until you have the right consistency (spreadable, not too runny). Split the frosting into two parts. Color half of it blue (I used both green and blue to make a turquoise-y color). After the cookie caked has been baked and cooled, frost half of it with the white frosting. Cover most of it with the graham cracker crumbs and gold sprinkles. 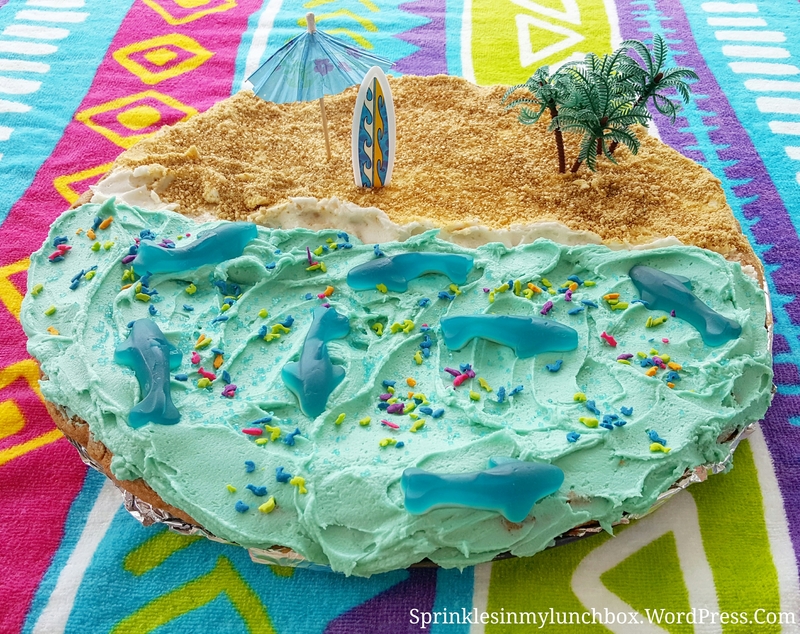 Leave a little bit of white frosting showing, for the waves. Next, add the blue water. 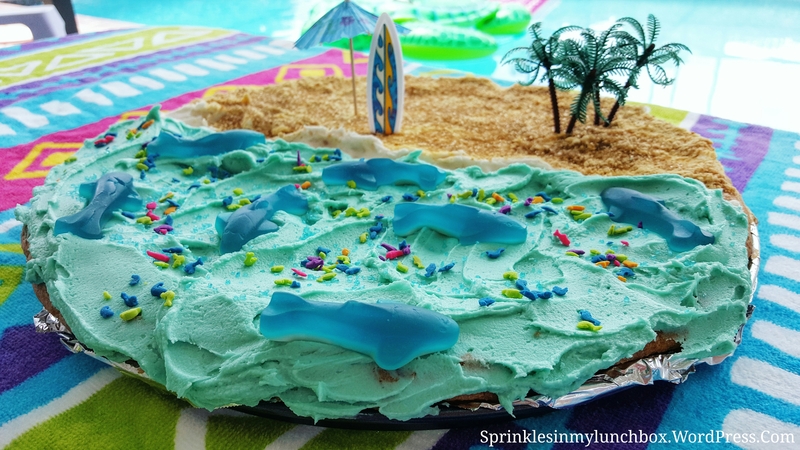 Then add the sharks and sea animal sprinkles, blue sugar sprinkles, palm trees, surf board, and umbrella. And there you go, little surfers! Hang then! Don’t let the sharks bite you!